The icyprushotels.com Holiday APARTMENTS are located on the main street of Kaparis in the popular and elegant resort of Protaras near Ayia Napa in Cyprus. Ideally placed for easy access to all essential amenities such as the Protaras center, the beach, supermarkets, Greek restaurants, taverns, bars, night clubs and boat rides. 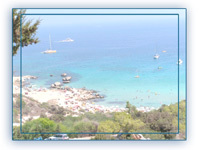 The icyprushotels.com holiday Apartments are well suited for those looking for freedom of movement and privacy. These modern and well planned two bedroom holiday apartments are furnished to a high standard. The apartments have an open plan living and dining room together with fully equipped kitchen (refrigerator, microwave oven, washing machine, iron, ironing board) and a TV. From the balcony there is a limited Mediterranean view. The airy and spacious master bedroom is beautifully furnished with a King Size bed a balcony door and a window. Sheets and towels are provided and replaced every week. Unfortunately no beach towels and for your piece of mind a safe box is there for you. The other spacious bedroom has two single beds. Temperature is individually controlled by you for your own comfort as all the rooms are air-conditioned.